Domer Home: Basement Bathroom Reveal! The color wasn't all that bad... it was a greenish beige color. However the previous owner did a poor paint job and missed sooo many spots. This was a good blank slate for us! We went with a nice soothing blue with a hint of gray; Rising Tide from Valspar Signature in semi-gloss. The linens were my apartment warming gift from my parents when I was right out of college. We would like to replace these eventually with a nice blue stripe or something more masculine since this is the man cave bathroom. Thanks Kathy! I shared it on your linky list today! Thanks for stopping by Yvonne! It is always super exciting to go through old stuff! 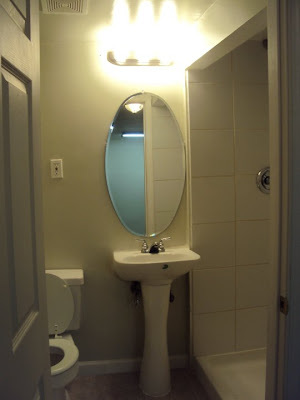 I would love to see your bathroom when you are done! Looks great! Love the zebra stripe, kinda unexpected. Thanks Rachael! It will be gone soon for something a little less "girly". New linens can be so expensive! It looks gorgeous! There is something special about that soft shade of blue with white accents. We would like to replace these eventually with a nice blue stripe or something more masculine since this is the man cave bathroom. This is so great, good to know that Basement Bathroom is finally revealed. All thanks to the basement contractor for this well written post. Thank you mate for really an impressive post, keep me posted.